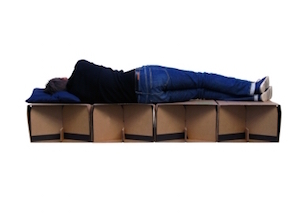 Leafbed is a modular emergency bed made entirely of cardboard. The identical modules can make an ergonomic adult bed, a child's bed or a stool. The beds can be shipped flat and are recyclable and biodegradable. They are intended to be used in situations where a large number of temporary beds are required quickly. The bed was conceived by the designers who founded Leaf Supply. They have partnered with paper manufacturer Smurfit Kappa for production and are willing to work with local producers worldwide.